While there are many different types of logos – from elegant and refined to quirky and surprisingly unexpected – my favourite logos are the ones that have a hidden message. Whether it’s Amazon’s subtle arrow between the A and the Z, both forming a smile and suggesting that they offer everything from A to Z, to FedEx’s hidden arrow between the E and the X – my favourite logos are the ones that carry a clever hidden message. And one of the best ways for a logo to sneak a hidden, playful message in is to make use of the negative space. While it’s incredibly difficult to actually design a logo that uses the negative space effectively, when it’s done well the results can be astounding. We’ve brought together a collection of creative, interesting and wonderfully clever logos that all make use of the negative space – whether it’s to add a hidden message or to simply add an extra element of style to the design. In either case, we hope you find our roundup interesting and, hopefully, useful for your next logo design project. Have you found any examples of beautifully styled, clever and imaginative logos that make a good use of negative space? Let us know in the comments. Alex writes for PrintExpress.co.uk, who offer beautifully designed business cards and more. You can read more from Alex on the Print Express Design blog. Previous PostStatic or Customized! 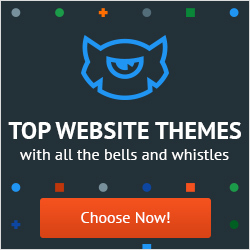 Which WP Site Will Suit Your Business? Next PostWhich SSL Certificate should you buy for your e-commerce business?